Once a year, the Nationals organization provides a tease for Nationals fans; an event signaling the looming arrival of spring training and generating excitement for the upcoming baseball season. This fantastic event is called NatsFest. Many Major League teams put on fan festivals around this time, and the Nationals are not to be excluded in that count. 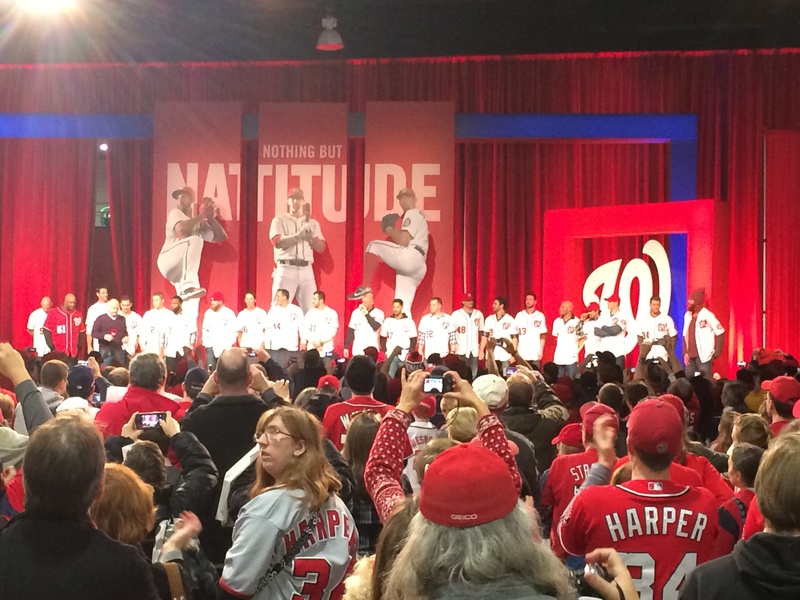 The 2014 NatsFest was Saturday, and even though I was over two hours late because of taking the SAT, I was there nonetheless. However, the 2014 festivities were much different than the festivities four years ago in 2010; the first year of NatsFest. They were two much different scenes, so I decided to share my experiences at both. In 2010, NatsFest was held at Nationals Park. Basically every part of the stadium was open; you walked in through the main gates, got to tour the locker room, hit in the real batting cages adjacent to the locker room, get autographs signed inside on the second level of the stadium, and listen to guest speakers such as Tim Kurkjian and George Will. Best of all, it was free and not very crowded at all. The Nationals had had a dismal year the previous season in 2009, and the fan support was accordingly low. Not saying it was empty, but I’m pretty sure it wasn’t the 8,400 that were at the Gaylord Convention Center this past Saturday. We parked in the stadium’s parking lot, got the tickets we had reserved, and made our way in for what would be such a memorable experience. I saw players up close such as Pudge Rodriguez and got to have my picture taken with Ryan Zimmerman. Back then the lines weren’t so crazy, so I went back a second time and got a picture with then-manager Jim Riggleman and then-National Jason Marquis. We toured the locker room, and as I mentioned, I took a few hacks in the batting cage across the hall. Those are the experiences not easily forgotten. The ones where you see up-close what you’ve watched so long on TV and have a new-found understanding for, in this case, your beloved team. 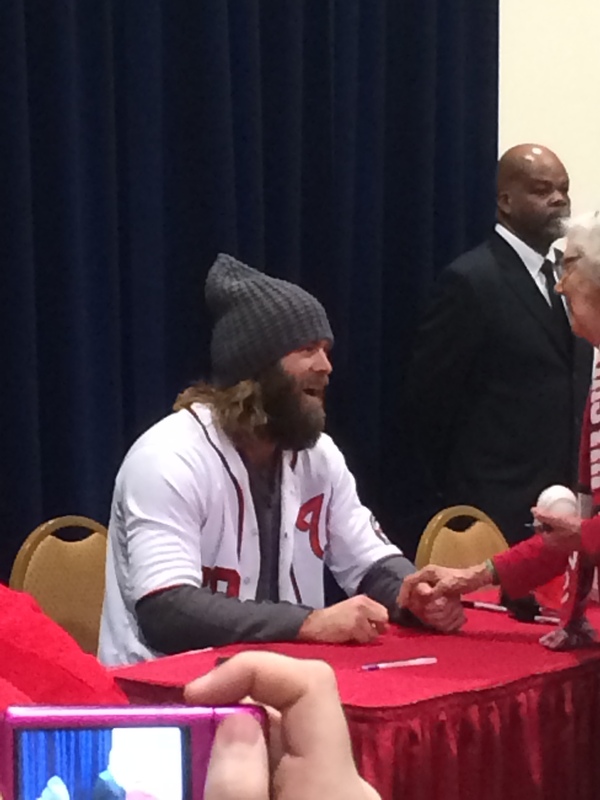 The Nationals organization did a spectacular job in preparing their first fan festival. I did not attend in 2011, 2012, or 2013, so we decided this year it was time for a return trip. 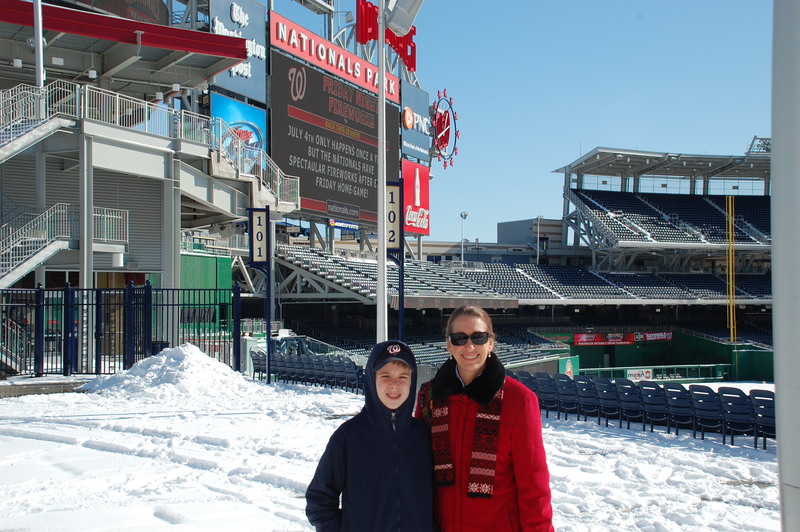 A lot changes in four years, and indeed much has changed since that memorable NatsFest at Nats Park four years ago. As the college search is kicking into gear, I had to take the SAT bright and early Saturday morning. When I saw the date coincided with that of NatsFest I was dissapointed because I figured since the SAT was so extensive, I would not be able to make it over there in time. Luckily, the problem was solved. I raced out of the test as soon as we were allowed to leave and my dad and I were on our way to the Gaylord Convention Center with just about an hour and a half remaining. But hey, better late than never right? We walked through the doors and stood there taking in our surroundings; looking at the vastness of the room and trying to decide what we wanted to do first. We took a lap around the Center, seeing the photo stations, the autograph stations, the main stage, and the makeshift field where Ross Detwiler was being bombarded by little kids for autograph requests. Dad and I listened to a panel which consisted of Mike Rizzo and newly aquired Nationals Jerry Blevlins and Doug Fister. It was interesting hearing them discussing their goals for the season, and Blevlins added some humor when he was asked how he could hit since he was coming from the American League. He responded by saying that he had one at-bat last season in an 18 inning game and he felt accomplished when he hit a foul ball in that at bat. He quipped that we should thus view him as a contact hitter this season. 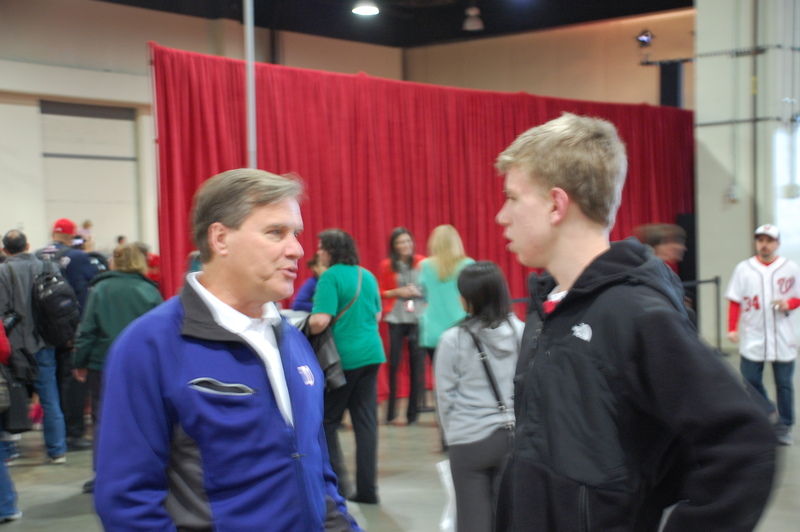 the Nationals’ TV broadcaster, just standing by himself, I jumped at the opportunity to finally meet him. To be honest, I’m not sure exactly what we discussed because I was a little shocked, but I’m sure it was legendary. I watch the games and listen to his commentary every day, and to finally meet him in person was a fun experience. Also, a few minutes later, I saw my friends from The Nationals Archive standing in the back of a Q&A session. Over the past year I have loved reading their blog posts and interacting with them on Twitter, so meeting them gave me the chance to let them know how much I appreciate all of their work. Finally, as we were exiting, I shook hands with the one and only Matts Bats, another Nationals blogger. If you haven’t heard of him, check him out. He’s doing some pretty incredible things for being a nine-year-old. Needless to say, since college is on my mind, that kid will have no lack of things to write on his college resume in a few years. So, all in all, even though it was only for an hour and a half, being able to go to NatsFest this year was definitely worth it. While it was different than being at Nationals Park, it was nonetheless an awesome day. I got to listen to the players, interact with people I wanted to see, and enjoy the spirit of my fellow Nats fans looking forward to this upcoming season. 16 days until Spring Training everyone…16 days.